My full bio is below but here is a brief summary of my performance experience. "Music is for the soul." There is nothing that makes an occasion more special than live music. In 1968 while working on my Bachelor of Music degree at the University of Victoria I became the accompanist for the cello department at the university and at the Victoria Conservatory of Music. In 1969 I won the City of Victoria Medallion and the Rose Cohen Memorial Trophy of Calagary with a virtuoso performance of The Baby's Family by Villa Lobos for which I received a mark of 97, the highest ever awarded by the adjudicator Phyllis Schultz who commented that my performance was so evocative that she wondered if I'd ever been to Brazil. In 1973 I received my degree in Music Performance. After the Degree Recital Robin Wood remarked that I had "played professionally". In 1997 I received a standing ovation for my performance of the Grieg Piano Concerto at a recital held at the Shawnigan Lake School. Since 2004 I have accompanied Mary Clarke’s violin students. From 2006 to 2010 I've been accompanist to the Avalon Singers of Victoria. Recently I have begun working with Clarinetist Larry de la Haye in performances with the Avalon Singers. We played at the memorial for Dr. Abram Hoffer in 2009. Over the years I have also performed at a number of private functions including weddings, receptions and other events. Scroll down to see some short videos of my playing. For more information on my performance experience go to my PERFORMING page. "When learning is enjoyable, students gain confidence in their ability to take on new skills. Simplicity has always been the essence of my teaching philosophy." Have you ever wanted to play piano or harp? Are you looking for someone to teach your children? 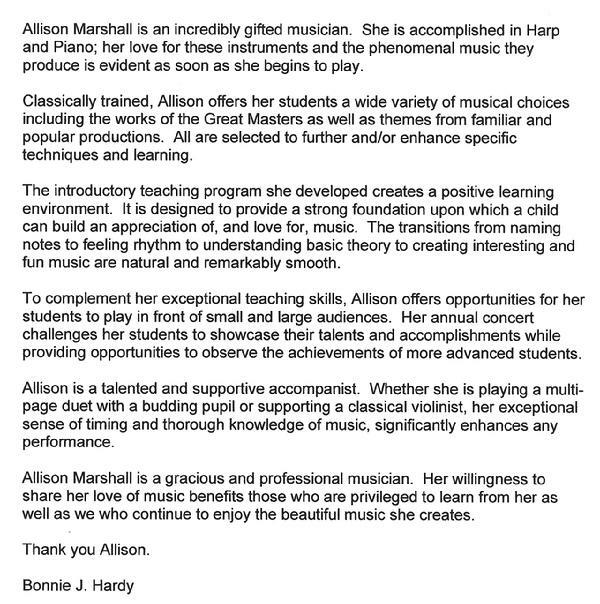 With 35 years of teaching experience I offer lessons in both harp and piano from beginners to advanced using unique programs which I have specifically developed to facilitate a better understanding of music. My mission is to make learning music interesting and fun. Variety is important. If students get bored or discouraged, they won't learn. To this end I use musical games and props as well as employing gentle and positive support to encourage students to develop skills and take on new challenges. There are numerous benefits to learning to play an instrument including improved fine motor and cognitive skills, increased self-confidence, enhanced creative thinking and problem solving skills, better communication and cooperation. I have developed materials which are relevant to the children and organized the program as a series of building blocks. I have also developed an adult guide for parents to use at home. An informational brochure is available. I always strive to make my students, whatever age they are, comfortable. I believe in being as supportive as possible. For more information on my teaching methods and experience please check out my TEACHING page and the VIDEO page. Allison Marshall was attracted to the piano as a toddler and began playing the piano at age five. She began accompanying at an early age, first to her vocalist mother and violinist brother, then for a junior church choir as a teen. Later, while at the University of Victoria, she accompanied cello students at the University and the Victoria Conservatory of Music. In l969, as a student of Robin Wood, Allison won the city of Victoria Medallion. Also that year in Calgary she won the Rose Cohen Memorial Scholarship Trophy with a mark of 97 from adjudicator Phyllis Schultz. In l965 Allison received her ARCT in Performance. In 1973 she completed her Bachelor of Music in Performance from the University of Victoria, and followed this with graduate studies in Music Education. 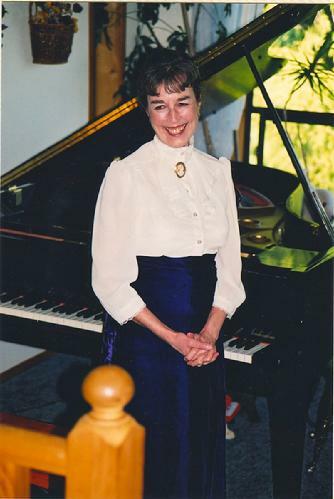 Allison’s developing interest in teaching beginning pianists led to extensive research into early childhood education which evolved into her highly successful program Childhood Horizons to Keyboard Musicianship, better known as Folksongs for Little Folks, which are largely based on the methods of Kodaly. Allison has invented and marketed several music education games : Musical Bingo in three levels : Musical Snakes and Ladders ; Octaves and Glissandi ; and a game of Musical Scrabble. These games are used in her teaching to promote musical concepts, and are enthusiastically received by students and parents alike. In January 2006 Allison began accompanying the Avalon Singers of Victoria. She is also accompanist to Mary Clarke’s violin students, as well as those of her own studio. Recently Allison has begun working with Clarinetist Larry De la Haye and they have performed together with the Avalon Singers. They also played at the memorial for Dr. Abram Hoffer. 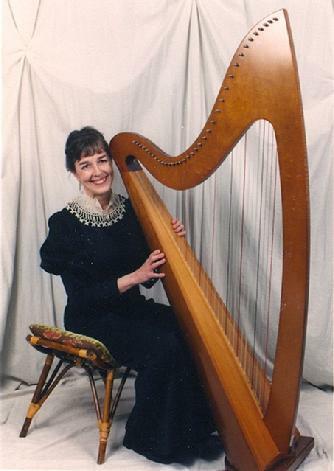 In 2006 Allison began studying Harp with Kathryn Ely who was so impressed with her progress that, only a year later, she encouraged her to start teaching Harp. She now has seven harp students. Allison is sought after as a pianist and harpist for weddings and other special occasions. In 1961 Allison graduated as a Registered Nurse from the Calgary General Hospital and practiced for twenty years in Peace River, AB as well as Nanaimo and Victoria, BC.